Skill Assessment Modules for TABE 9 & 10 is a complete software-based system to help improve student results on TABE 9 & 10. It combines the power of skill-based study plans with targeted skill-level tests to promote student NRS gain. The program's powerful management system provides the tools necessary to track student progress, customize student study plans, and determine TABE readiness. The complete set includes levels E, M, D and A. Each student study plan uses actual TABE results to generate a personalized instructional plan based on Skill Assessment Modules for TABE 9 & 10. The program's powerful management system provides the tools necessary to track student progress, customize student study plans, and determine TABE readiness. The complete set includes levels E, M, D and A. Each student study plan uses actual TABE results to generate a personalized instructional plan based on TABE skill mastery information. TABE data can be manually entered or imported automatically from TestMate TABE or TABE-PC. Instructors can customize study plans with notes and comments. The global resource database can be customized to reflect institutional preferences. For each TABE 9 & 10 skill, there are two targeted 20-question tests to help assess student mastery. Each test can be randomized so that students don't become too familiar with the test questions. SAM questions mirror the format of the TABE 9 & 10 questions, enabling appropriate testing practice. Review mode allows a student to review a completed test with the correct answers, their own answers, and feedback for questions answered incorrectly. 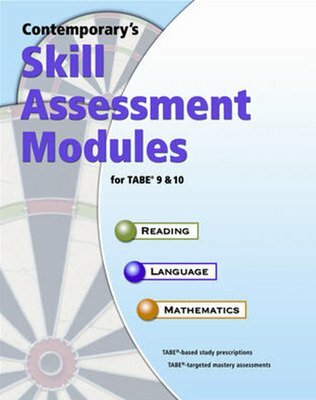 Skill Assessment Modules for TABE 9 & 10 contains a half-length, TABE-formatted practice test, which is used as an indicator of TABE progression before using an actual TABE form. Randomization prevents the student from becoming overly familiar with the test questions in the event that he or she takes the same test multiple times. The management system provides complete tracking of student progress in the study plans and skill tests. Preferences can be set, such as turning randomization on or off. Instructors can customize the resources in student study plans, as well as inserting notes and comments. Detailed reporting functions through the export feature help accommodate institutional and state reporting needs.